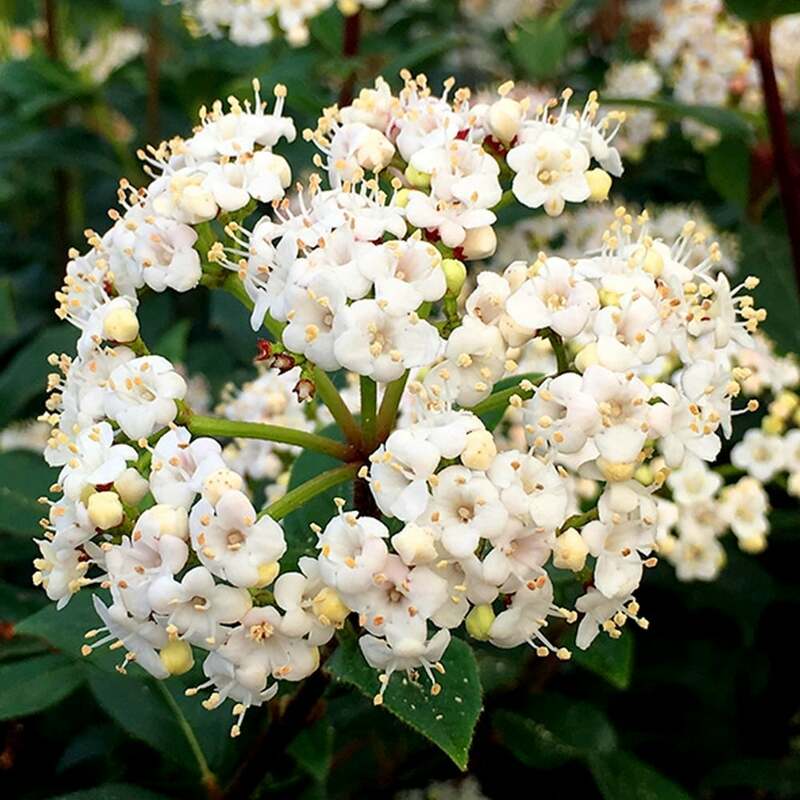 Viburnum Tinus French White is an evergreen shrub that features gorgeous white flowers overs handsome dark green foliage. It is a plant with multi-seasonal interest, producing flowers in winter, blueberries in summer and the evergreen foliage provides all-around year interest. It is a tough and sturdy winter flowering plant, that will decorate your garden when other plants will lay dormant. French White is suitable for informal gardens and winter gardens. It is a compact growing shrub that can reach a good height of 3 metres. In December, it produces flat head white flowers in clusters that are bright and look very appealing over the foliage. The leaves are ovate dark green, providing a beautiful and soothing contrast for other nearby perennials. In summer, clusters of blueberries are followed after flowering, that are cherished by the birds. The berries add significant ornamental value to any garden. French White can withstand harsh winters but need protection against cold winds. Plant it in a sheltered spot in full sun or partial shade. It will thrive in a moist soil that is regularly drained. Clogged water can severely damage the roots. Water the plants until the roots are established. Pruning French White does not require any special skill. Simply cut back any overgrowing shoots to maintain its compact shape. It is an easy to grow plant that requires low maintenance and is usually able to cope with neglect on its own. Viburnum French White is an excellent plant for hedges as it is very tolerant to trimming. Plant them in the back of a flowering border where its foliage will provide a lustrous background.